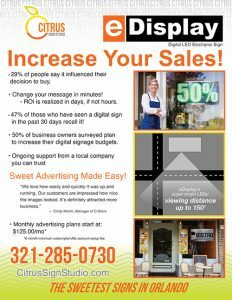 Are Digital Signs More Effective Than Printed Signs? | Need to Update Signage? Need to Update Your Signage? Are Digital Signs More Effective Than Printed Signs? Digital signs are quickly becoming common solution for businesses to advertise their wares; many businesses are actually ditching traditional printed signs and upgrading to LED signs. While digital signs do have lots of marketing potential, it doesn’t mean that printed signs are useless or obsolete. Digital signs and printed signs have different uses and purposes, and cost can all play a factor in which option is the best way to advertise your business. Believe it or not, the Ancient Romans and Egyptians used signs of carved stone or clay. Even during the Middle Ages in Europe, printed signs were used as advertisements for trade shops, pubs, and markets. Having been around that long, it shows how we have fared well with printed signs all these centuries.